How Many People are Playing Outland TBC on Warmane? Warmane is a private server of World of Warcraft and now it attracts lots of gamers, which is perhaps the top performing Private World of Warcraft Server. 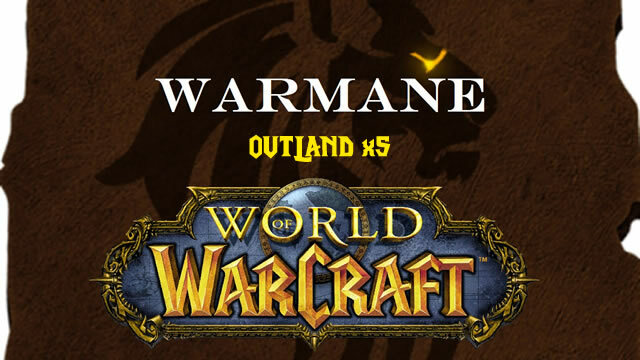 Outland TBC is the Warmane WoW series. launched on May 20, 2017! Trainer costs will be lowered to 20% of original cost. All other rates will be x1. The realm will be progression based, emulating the 2.1 patch on the beginning, with all respective attunements. The following raid content will be available at the beginning: Karazhan, Gruul's Lair, Magtheridon's Lair, Serpentshrine Cavern, Tempest Keep. Isle of Quel'Danas will be closed until the realm reaches that point in progression. The isle itself will be progressive as it was designed, once released. PvP gear will be Season 1, Gladiator gear. The marketplace will not be implemented for at least a month and on release it will only contain items that were already obtained by the players. The marketplace itself will be progressive. Quality of Life additions such as Dual Specialization, Faction Change, Race Change, Experience Lock might not be present immediately on launch but are planned to be implemented. Outland TBC faction balance is now Alliance 48.9% to 51.1% Horde, always capped with 8588 players. Top most players on Warmane servers. Realm statistics are here. If you are looking for a serious leveling + PvE/PvP experience, Warmane Outland TBC is your best choice.